A visit to the Roman Colosseum doesn't have to take up half a day. 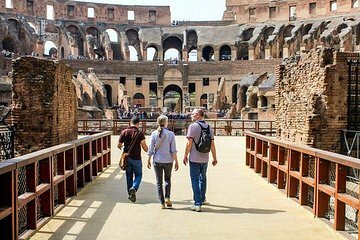 Get in and out in just 1 hour on this express tour that lets you skip the long ticket line and head straight inside to begin exploring the most famous symbol of ancient Rome. Walk among the first and second tiers while a guide describes gladiator fights, roaring crowds, and brutal imperial games, and then descend to the underground level to see where lions and other wild animals were kept before being released into the arena. Very disorganised. Left waiting between Colosseum and Roman Forum Tours. Roman Forum and Palatine Hill tour was overcrowded and no audio assistance so difficult to hear. Two stops in that tour and that was it, all a bit of a rush. Colosseum tour was ok. Disappointed. Total Scam!! they claim small group tour so when we showed and there were only 6 people for our tour things looked good. Then they told us to go inside to meet our real tour guide...turns out there were about 50 people in the tour all pushing and shoving so we could barely see anything or hear the tour guides broken English....They take you underground for about 5 minutes not worth the extra money.... although the upper level had some really nice views. Then after the tour we hung around waiting for our tour guide to take us to the Roman Forum and Palatine Hill. Except it turns out all it includes is a basic entry ticket without a tour that you can buy yourself on the spot for a couple euro!